Could China Lead Way in Using QR Codes for Mobile Transit Ticketing Instead of NFC? Shanghai Metro Could Provide Answer | NFC Times – Near Field Communication and all contactless technology. The Shanghai Metro has launched a trial of QR code-based mobile transit ticketing. A successful rollout could show that QR codes are fast enough to replace NFC for mobile fare collection. Shanghai Metro, one of the busiest subway systems in the world, has equipped all 389 metro stations with QR code scanners, though most of the stations only have two entry and two exit turnstiles equipped for the trial, which began Saturday. 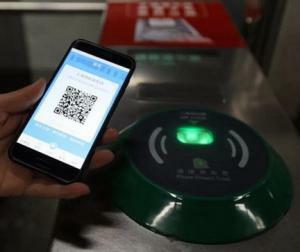 And Shanghai is not the only Chinese city to have launched QR code-based fare collection, even as the transit authorities in these cities also support NFC mobile ticketing. Other transit authorities trying out or rolling out QR codes include those in Guangzhou and Hangzhou. Mobile payments giants Ant Financial and its Alipay service and Tencent Holdings’ WeChat Pay are driving the move to QR code-based ticketing. But Chinese bank card network and major NFC backer China UnionPay also has a QR code-based payments service and is supporting the Shanghai Metro’s latest app. Article has about 1240 words.